This is a place that is great for an educational outdoor farm scavenger hunt. These clues point to common animals and equipment on a farm. However, it doesn’t need to stop there, as you can extend the challenge. Setting extra targets like explaining the use of each clue item, or what the animal eats can make a huge difference to the depth of a hunt. Also, our farm photo scavenger hunt clues are amazing fun and the photographic challenges can be combined with the more educational riddle clues, such as completing one photo challenge before progressing to the next riddle clue. However, be careful where you hide the clues, just remember that pigs WILL EAT ANYTHING! When people think of farms, they never think that this could be an ideal location for a farm scavenger hunt with an educational twist. However, that just means they have not come across our article yet. If you’re an educator, and looking for new activities to spark your student’s interest, we welcome you to read on as we explore how you can use this location to cover both aspects effortlessly. This location can be the ideal choice to help young children learn all about farm animals from our scavenger hunt clues. 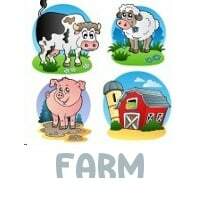 This can be achieved by including in the game some of what the animals do, how they live, or how they provide us with specific food elements; we can help to educate the student, while still making the farm scavenger hunt fun along the way for them. A farm scavenger hunt list doesn’t have to be short. Creating funny scavenger hunt ideas is not difficult, as most of the time farm animals give us opportunities to make things fun. Combining challenges, photos, or dares (safe ones) in the game can really add a fresh twist and provide great mementos. The clues and riddles here can point to more than just the animals on the farm. The farm scavenger hunt could also include the equipment located on the farm, and what each of their jobs are. These extra clues could be classed as bonus items for the student to earn more points quickly, while doing the scavenger hunt game at the same time. Now remember, if this is to be an educational event, the more items added into the list to locate, the longer the farm scavenger hunt could take. For that reason, if the class is limited on time, it could be broken up to take place half the time at the location, and the other half to be completed back on the bus or in the classroom. By taking this approach, the teacher or instructor, could make it more educational for their students, to earn higher challenge points the more they can solve the 2nd or third level even clues and riddles created in advance. In addition, when choosing these extra challenging scavenger riddles, keep in mind of the students’ grade level at all times. The reason being, is we as educators want to be certain that the children participating in these farm scavenger hunt events can solve the riddles. With that said, if the scavenger hunt ideas are going to be for groups of teens, we could also make their challenges involve the planting processes, the agricultural side, and for additional challenges to be more advanced. Furthermore, when it comes to creating farm scavenger hunts, taking the time to plan accordingly to if it will be a short term game, or extended game, will generally set the foundation on how long our riddles, and clues list will be. Now, if we wanted to make this more fun, we could also include images, or items that the students will need to collect during the farm hunt, if we so desire. When it comes to putting together a farm scavenger hunt, the riddles and clues that can be added into the event are many. In addition, if we are wanting a new, and funny way to teach our kids about farms and their importance to us, this type of event surely can cover that aspect easily. We hope some of our tips, and suggestions will help (see our ideas page) . Hen, Rooster, Barn, Tractor, Cow, Hay, Pig, Sheep, Water, Horse, Milk, Wheat, Pesticide, Puppy. Grape, Fertilizer, Fence, Corn, Market, Apple, Wildflowers, Cherries, Seeds, Cotton, Potato, Rake, Saddle, Grain. Get loads more photo scavenger hunt clues by clicking the link.